Thus, from September 2017 to March 2019, we are collaborating with some of the design teams in the competition to organize construction workshops to build the design entries based on site at Abetenim Arts Village in central Ghana. The Land Art Workshop is designed as a Group Residency to bring together creative persons from around the world to immerse in the local Ashanti culture and help build the entry to the 2017 Land Art Competition. During the residency, participant will be assigned a part in the project process, and participant will use the rest of the period to create own works. Selection of participants will be through an open call for participants. The programme aims to foster collaboration for cross-fertilization of practice among the international participants. Most evenings will be used for reviewing workshop progress along with informal discussions and digital presentations of portfolios by workshop leaders and participants. The workshop will end with a Community Day, a public celebration of the completed project by way of open house exhibition of the products of the workshop, public performances, and foods. Workshops to realize design entries will be listed below. Join us from 1 month to 2 months as a workshop participant to help build Eternity Ground, a design entry in Nka Foundation’s 2017 Land Art Competition by Karolina Porada at Cracow University of Technology in Poland. WHO: Open to landscape architects, artists, designers, architects, urban planners, structural engineers, art critics and art researchers and university students from around the world. Students can use the opportunity for internship, personal research or thesis. COST: Food and accommodation 90€($100)/week and project contribution 400€ ($450). Airfare, visa and vaccination are on your behalf. WORKSHOP LEADER: Karolina Porada, a polish landscape architect. Karolina is a graduate assistant at Cracow University of Technology in Poland, currently working on her phd degree which topic is the connection between land art and landscape architecture. Join us during the construction of the land art installation and become a member of our team! Together we will create a unique place of rest and recreation in the heart of the Abetenim Arts Village in Ghana. It will be an unforgettable experience for you and an opportunity to get acquainted with local culture. You’ll learn new skills and make new friends. Join us and see how an arts village begins to function as a PLACE! 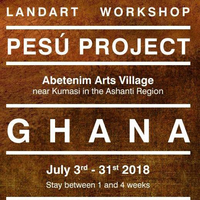 The Land Art Workshop is designed as a group residency to bring together creative people from around the world to immerse in the local Ashanti culture and help construct the Project ‘Pesu Ghana. Workshop is organized in partnership with Spackman Mossop Michaels, an Australian Landscape Architecture firm and Nka Foundation. We are looking for: landscape architects, artists, designers, architects, urban planners, structural engineers, art critics and art researchers and university students from around the world. Students can use the opportunity for internship, personal research or thesis.